Stop predators from reaching your existing purple martin house and offer the birds supplemental food with this S&K Predator Guard and Feeder Tray package. This fantastic kit provides a plastic baffle and feeding tray, both specifically made to install on your existing S&K Galvanized Steel Easy Pulley System Martin House Pole (not included). The generous, 10.75" diameter baffle handily keeps squirrels, raccoons, and snakes from climbing up the pole and reaching your martins. Attach the included S&K Feeder Tray to the top of this guard, acting not only as a further barrier, but also offering up to 3.6 quarts of supplemental food to your martins. The large, center hole on each piece accommodates your existing, 1.9" outer diameter pole, while the additional, smaller openings allow you properly install the rope. This unique design enables the tray and baffle to move up and down the pole with the pulley. Their black color and plastic construction last for many seasons, remaining stable even after exposure to sunlight. Keep your purple martins well fed and protected from ground predators with this Predator Guard and Feeder Tray package. Made in the USA. 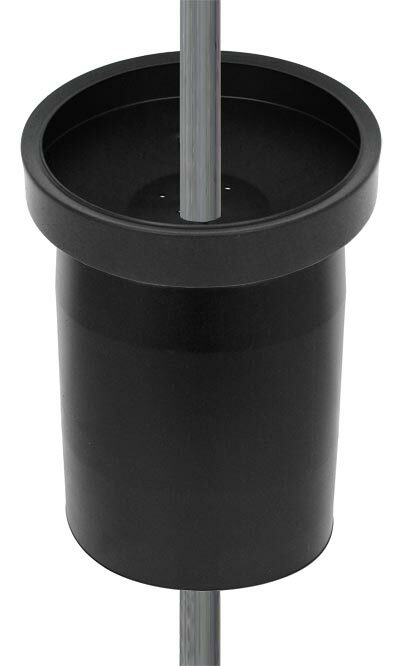 S&K Predator Guard for Round Pole, Black, 10.75" dia. Brome Seed Buster Tray Feeder and Seed Catcher, 20.5" dia.